If you could only see one sight in North America, what would it be? Now that is a tough decision, isn’t it? Hopefully you will never have to choose just one; where would one even start with a monumental selection like that? After they gave it some careful thought, we would be willing to bet that most people out there would likely make their selection from an elite group of sights that includes places like the Grand Canyon, the Statue of Liberty, the Golden Gate Bridge, the Canadian Rockies, and Niagara Falls. All of these sights are deservedly famous and are all symbols of the special natural and man-made splendour that both the United States and Canada are known the world over for. 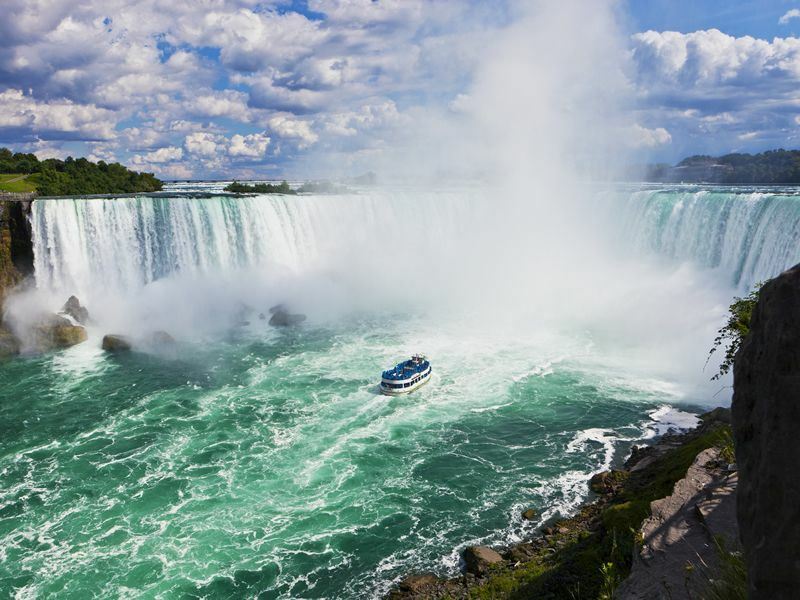 Of that list, only one straddles both countries though, allowing you to see the best of both lands in one fell and splashy swoop: Niagara Falls. Seeing Niagara Falls, especially from a helicopter, should be on everyone’s bucket list. From the start, Niagara Falls has been the type of place that seemingly existed simply to take one’s breath away and then render them speechless. When the earliest Americans were criticised by their English cousins for straying from speaking the more proper English found at home in England, an anonymous writer remarked “who would describe Niagara in language fitted for the falls at London bridge?” Translation: there are no words to describe the beauty of Niagara Falls. A remnant of the last ice age, Niagara Falls is actually the name given to three majestic waterfalls located quite literally on the border of the American state of New York and the Canadian province of Ontario. The three waterfalls are the American Falls and Bridal Veil Falls located on the New York side of the border, and Horseshoe Falls on the Ontario side of the border. Debate has raged for centuries over which set of falls are the most stunning, but one thing everyone agrees on is that you can’t come to Niagara Falls without getting up close and personal with all three waterfalls. What’s up to you though is how you decide to see them. I suggest seeing the falls from three different vantage points: from land, from water, and from the sky. Anything less, and you are selling yourself and Niagara Falls a little short. As far as seeing Niagara Falls from land, you have a couple options. Prospect Point on the American side provides a good albeit semi-restricted vantage point. On the other hand, Goat Island, an island in between American Falls and Horseshoe Falls on the New York side, gives an awfully impressive perspective of the rapids leading up to the falls, the falls themselves, and offers access to the Cave of the Winds located directly under Bridal Veil Falls. On the Canadian side, Queen Victoria Park offers straight-on views of all three waterfalls and probably provides the most impressive vantage point of the dry land options. From the water, the legendary Maid of the Mist is quite simply the only way to go in my opinion. This tour boat started giving visitors up close and personal views of Niagara Falls way back in 1846. The modern incarnations of The Maid of the Mist boats ferry you right next to all three falls, and you will be happy you are wearing a poncho, because you are destined to get wet. Being on the water and essentially below Niagara Falls, gives you a unique perspective on the strength of these falls and of how truly wide they are, which is in the end where their majesty and power truly lies. From the sky, the Canadian side of Niagara Falls is dotted with high rise buildings offering vantage points and views down on Niagara Falls, the most notable being the Skylon Tower and its observation deck. The most exciting option though is without a doubt seeing Niagara Falls from the seat of a helicopter, a true once-in-a-lifetime experience. The helicopter tours of Niagara Falls allow you to rise above and then swoop down on the falls and then float through a sea of mist and rainbows like a bird. This is quite simply one of the most exhilarating experiences anyone could ever have, and for that reason, it rests securely on our bucket list. More information and to book: One of the most well-known landmarks in the world, Niagara Falls is a sight to behold.